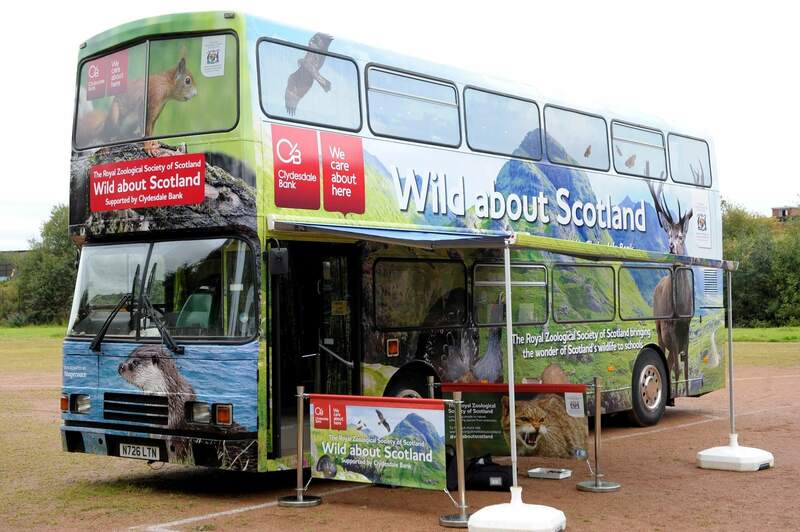 Younger visitors to Deep Sea World, Scotland’s national aquarium, will be able to hop on board a double-decker bus full of amazing information about our native wildlife on Monday, July 31st – Wednesday, August 2nd. The North Queensferry aquarium is playing host to the ‘Wild about Scotland’ bus which is on a nationwide tour, bringing the wonders of Scotland’s natural habitats and native species to life for children. Wild about Scotland’ is part of a Royal Zoological Society of Scotland (RZSS) partnership with Clydesdale Bank. The bus has been fully converted to provide a unique and inspiring teaching space for schoolchildren, and provide curriculum-led lessons delivered by the Royal Zoological Society of Scotland’s (RZSS) Discovery & Learning team. Deep Sea World’s Nancy Sidhu said: “We are looking forward to welcoming the ‘Wild about Scotland’ when it stops off here at the aquarium. “The bus is a fun, interactive way for children to have a hands-on opportunity to appreciate our natural heritage and learn about it in an exciting way. “Visitors to the aquarium are constantly surprised to discover just how rich the aquatic environment is right here on their doorstep and we welcome any initiative which helps to raise awareness of the wonders of our native wildlife,” she added. During a visit to the bus families can take part in activities such as guess the animal skulls, build a beaver dam and look at mini-beasts under microscopes. Barbara Smith, CEO of the Royal Zoological Society of Scotland, said: “Conservation through education is one of the founding principles of the Society and it remains one of our key goals to this day. “By bringing wildlife education to people’s doorsteps, via our bespoke bus, we hope to be able to inspire and encourage the next generation of conservationists,” she added.